Very good analysis of the work and appreciation of Ezquerra's unique strengths as an artist. Thanks for sharing, Broodblik. Yes, a very thoughtful and well expressed article. Thanks broodblik. It's interesting that the quality Ezquerra's fellow pros value most in his work is his consistency - it's the word that crops up, consistently, in the Thrillcast's excellent tribute to King Carlos. David Bailley's memory of Ezquerra describing the serrated outline he gave to figures as a way of animating a static image - as PJ Holden adds, a way of making the character come out of the page, towards the reader - was wonderful. The most acute observation belonged to Dave Gibbons*, who said Carlos's art reminded him of the sense of involvement and energy in his own drawings as a small boy, where you could see every bullet passing between dogfighting aircraft - the idea that Carlos was telling stories the way readers would want to do if only they could draw as well as him. * Who really does talk about comics fantastically well. He was a great choice for Comics Laureate. I am looking forward to getting hold of some classic Equerr stories like Major Easy and El Mestizo for the first time. As a small boy I never understood what those dotted lines were, so it is very interesting to get an explanation of it all these years on. Another thing I could never quite work out was whether the shading around Johnny’s eyes when he was wearing his helmet was meant to be a shadow or a visor. I always knew it was about focussing. What surprises me is more people in the B+W era didn't do something similar. Some played with slightly thicker black lines, but Ezquerra's had real dynamism to them. I adored his use of colour on his painted (or colour inked) pages. 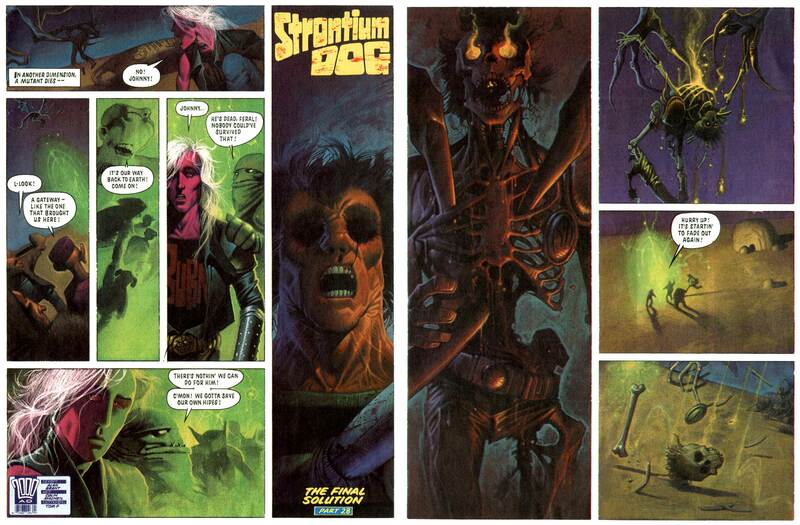 Splashes of neon through the spectrum from panel to panel. There's also a panel of Odell in Countdown to Necropolis just loosely painted in silhouetted in a lit doorway, which gives another layer to the art. Yes, his painted work was incredible. 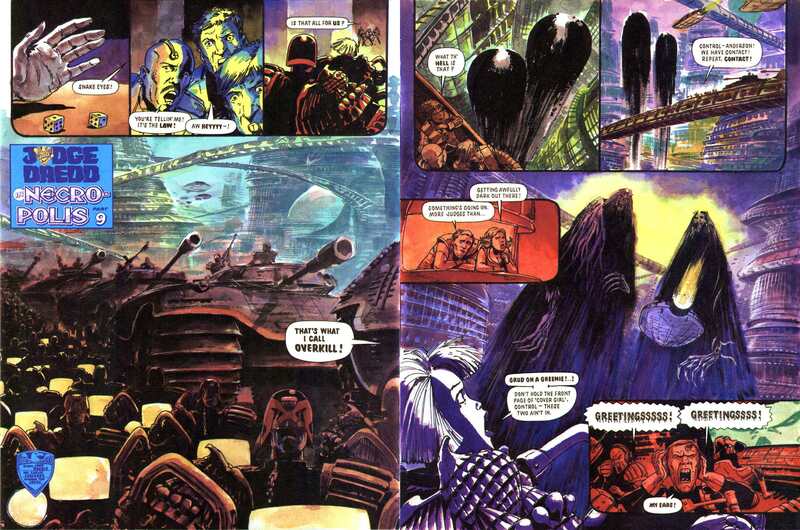 While everyone else was trying to do Bisley, Carlos had a beautiful, dynamic and atmospheric style all of his own. Still can't believe he's not around any more. 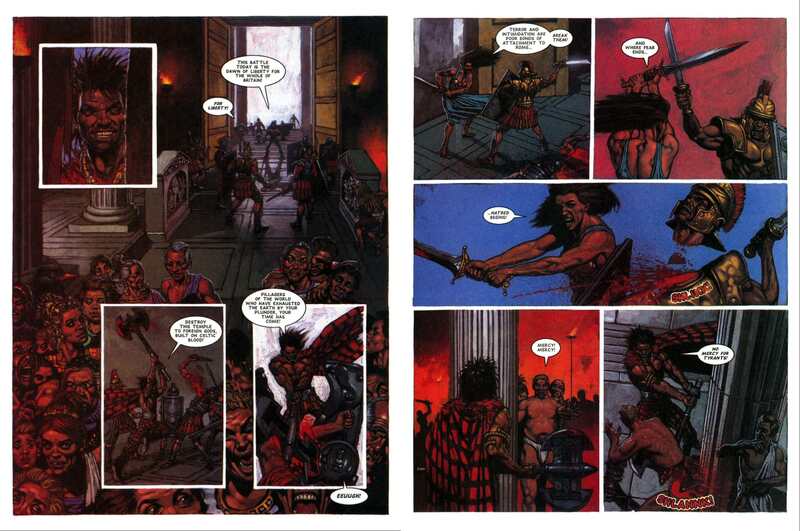 Douglas Wolk mentions that sequence in his excellent Necropolis post, one of the finest pieces of writing about any 2000ad story. It's the chromatic equivalent of the jagged outline technique discussed above. Look at the way the blue figure pops out from the red-orange background. 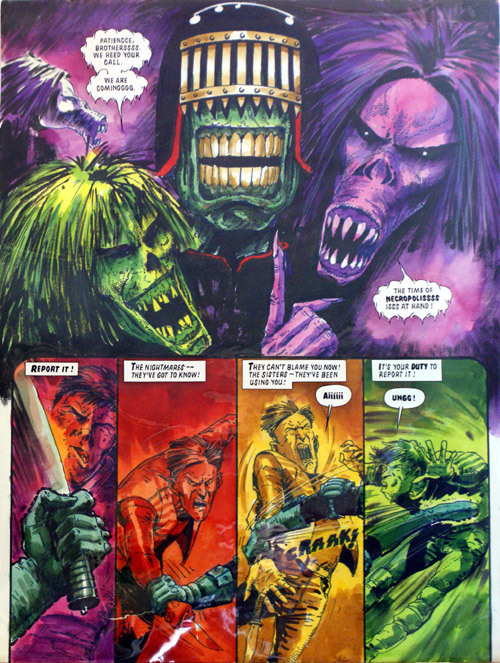 I remember going through Necropolis and Young Giant, doing little roughs in my own sketchbook to capture the different colour combinations he was using, because I was convinced Ezquerra had worked out a secret system of colour that worked on the brain to produce maximum impact. As Jayzus says, in terms of colour, Ezquerra was refining his own distinctive aesthetic at a time when everyone else wanted to be someone else. 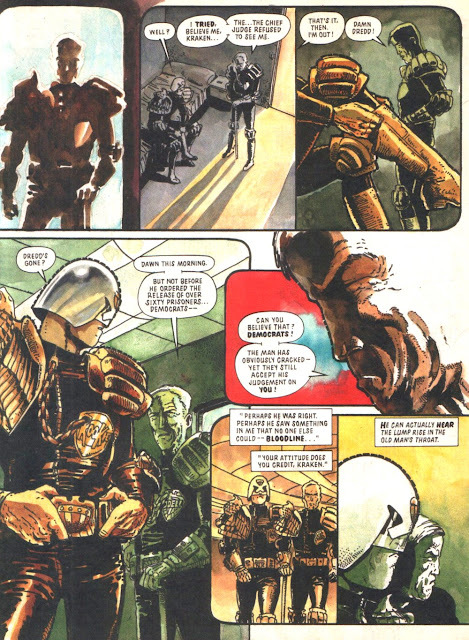 You see the odd panel of Dermot Power or Sean Phillips's painted Dredd that make occasional use of the technique, but they're rare. It's only really MacNeil - who's open about his debt to and adoration of Ezquerra - who makes real use (the best possible use) of Carlos pushing the envelope, like Chuck Jaeger, exploring the limits and showing others the possibilities for original expression the medium he loved still contains. And that's just one aspect of Ezquerra's game. Alongside the bombast and chutzpah of panels that laid down bold slabs of ink straight from the bottle, he could suddenly drop the thick black line and switch to beautiful, delicate studies of MC1 architecture that reminded me of the crystalline structures demolished by the Dozers in Fraggle Rock rather than any other artist's vision of his most enduring and beguiling creation. 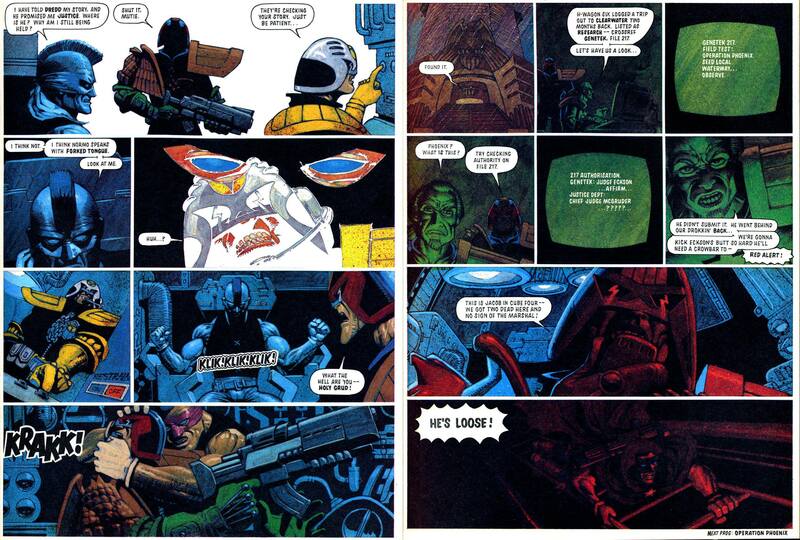 Again, Ezquerra was using that contrast, that shift in focus and depth, in the service of controlling the reader's eye and interest, taking them through the panels and around the page at the speed and in the direction that best told his story. What a talent, and what a loss. Yeah, it's amazing work. 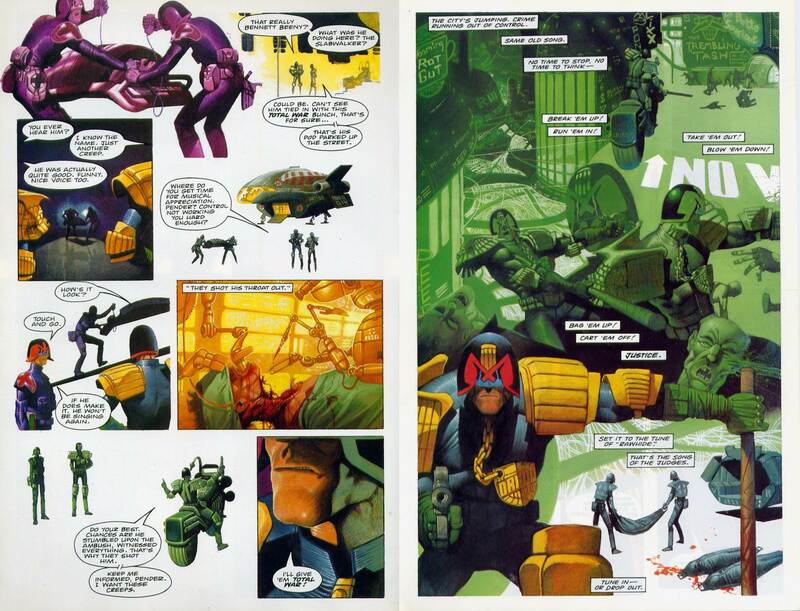 Colour Dredd in the annuals was a Christmas treat. A colour Carlos epic, really was like having our Christmases at once. I love black and white, it's what I grew up with - but this was stunning. As Jayzus says, in terms of colour, Ezquerra was refining his own distinctive aesthetic at a time when everyone else wanted to be someone else. One of the most interesting things I thought anyone said on the Thrill Cast was (I think?) PJ, who observed that there are many, many artists working today who you can immediately identify as influenced by Bolland, McMahon, Kennedy, Dillon, but no one you can point to as wearing an Ezquerra influence on their sleeve. McNeil had an early Carlos phase, but it’s a fairly brief period in his own impressive canon. There are so many ‘tics’ that you can identify as being unmistakably Ezquerra — the dashed outline, the firing-a-weapon-and-round-impact-in-the-same-panel thing, split panels, round cornered panels, montage pages… occasionally you’ll see an artist pay obvious homage to one of these, but no one, Colin briefly excepted, seems to have attempted to absorb the whole thing into their style. Maybe it’s because, as D’israeli noted when he attempted his own homage to Ezquerra in an Apocalypse War flashback, all these things looked deceptively easy when Carlos did them, but turn out to be murderously hard when attempted by lesser mortals. As a kid, those split panels drove me mad. I was outraged that Ezquerra was cutting corners, and felt sure the writer would be narked that he'd drawn what was essentially one big panel instead of the three I imagined had been described in the script. I now treasure them and understand this was an example of what Carlos meant when he said he could control the speed of the story. TB Grover had almost certainly only described one panel, but trusted Carlos to make his own decisions regarding storytelling. You make another great point about the idiosyncratic nature not just of Carlos Ezquerra's costumes, but of his unique talent for character design and his entire aesthetic. I can sympathise, Jim.